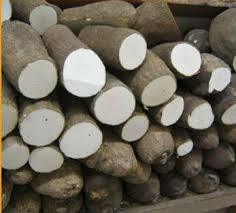 Cocoyam is a tropical starchy tuberous root crop. There are many varieties of cocoyam but the most common are the soft variety used mainly as soup thickeners (such as in bitter leaf or ohs soup) and the yam-like variety that can be boiled in a short time and eaten with sauce. 100 g provides 112 calories. Their calorie mainly comes from complex carbohydrates. However, the roots are very low in fats and protein than in cereals and pulses.